These Thai fish cakes are simple to make and they are utterly delicious. They are packed with the freshest ingredients and because they are homemade, you know exactly what goes in there. Nothing but the best for your family. They can be the perfect appetizers just as they are. TIp: For a more substantial meal, make the fish cake into a larger patty size and you can turn it into a fish patty burger the next day! Clean the salmon fillet and check for fine bones. Slice the salmon fillet into long stripes. Finely diced the salmon stripes. 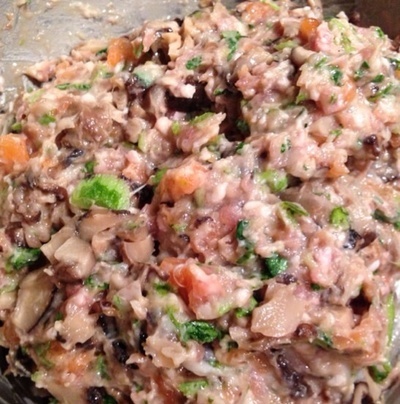 In a large metal bowl, combine the fish paste, diced salmon and pork mince together. Lightly season with salt, sugar, soy sauce and a dash of cooking wine. Thoroughly mix together until you reach a thick, elastic texture. Take 2 tablespoons of the mixture, roll it into a small ball. In your palm, flatten the mixture into 1-2cm thick patties. Fry the fish cakes over a medium heat for about 5 mins on each side or until crisp and golden. Remove and blot off the the excess oil. Look at the delicious fish cake. It smells so fragrant, too. Generously scatter some seaweed flakes on top. Serve warm with sweet chili mayonnaise on the side. For grown-ups: garnish with fresh scallions and mild red chili pepper. These fish cakes are the perfect izakaya bar snack to go with your evening drinks.